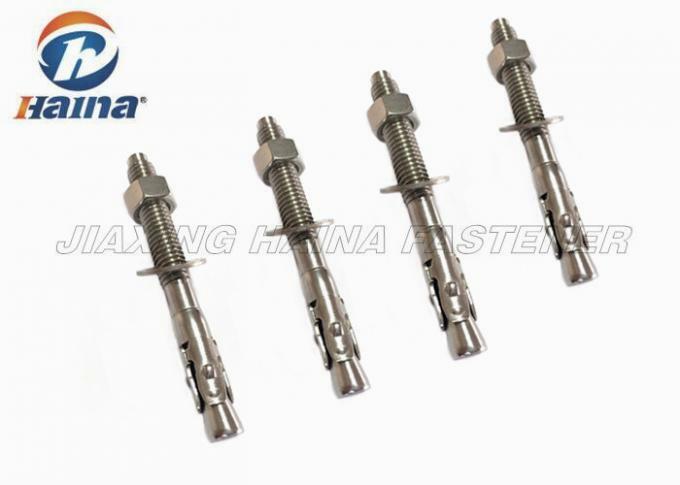 There has heen three common styles of wedge anchors: fully threaded, partial threaded and the full-bodied wedge anchor. The wedge anchor bolts, also known as through bolts, expansion bolts and expansion anchors, which is designed for consistent performance in concrete. Wedge anchor consist of a stainless steel expansion clip, threaded stud body, nut and washer, which can be made of carbon steel(zinc plated, hot-dipped galvanized) and stainless steel commonly as SUS304(A2), SUS316(A4). They are operated on a general principle and are simple and easy to use. Wedge anchor can be hammered below the surface of the concrete while no longer needed. Anchor diameter equals drill hole size. The expansion clip is formed around anchor, providing full expansion for dependable,superior supporting power. Expanding clip will not fall off or twist in the hole. Each wedge anchor has a minimum embedment requirement. The anchor diameteris the same as the drill hole size. Inspectable torque values, requring proper installation. Stainless steel wedge anchor provides high corrosion resistance. Widely used in securing the through objects' fastening, such as equipment,channel steel, guide rail, holder, steel structure, escalator, handrail and curtain wall etc. Every wedge anchor can be suitable for the standard anchorage depth, and also fit for shallow mining depth, to provide supreme flexibility for installation. Moreover the long thread offering the spacing installaiton, and can be flexibly adjustable to easy the installation. Design head of tapping, protecting the thread while tapping into the hole. Holding values for Stainless Steel 304 wedge anchors rise when the diameter increased and the length of embedment into the concrete. Widely used in securing the through objects' fastening, such as equipment,channel steel, guide rail, holder, steel structure, escalator, handrail and curtain wall etc. General Fastening applications where need high strength and superior corrosion resistance. Application for fixing concrete, natural solid stones. 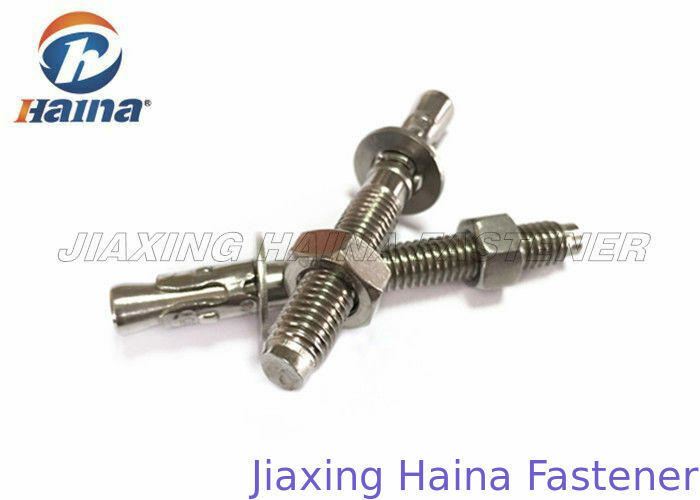 Common chioce for fastening, which provide high tensile, offering high holding power and corrosion resistance and don't need any coating. Every wedge anchor can be suitable for the standard anchorage depth, and also fit for shallow mining depth, to provide supreme flexibility for installation. Moreover the long thread offering the spacing installaiton, and can be flexibly adjustable to easy the installation. Design head of tapping, protecting the thread while tapping into the hole. Competitive prices with professional factory supply. Perfect fastening solution with 10 years experiences to solve your problem: Wide range of parts selection. Durability testing and critical technical design to enhance fasteners lifetime. 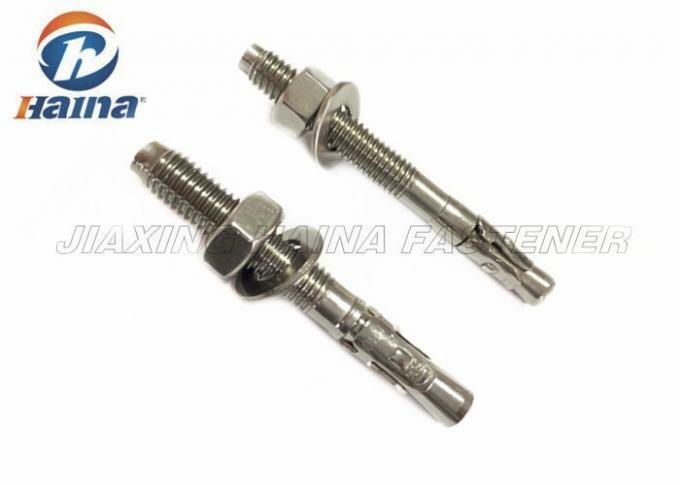 Specification: M8-M36, 1/2 to 1.1/2"
Specification: M6-M36, 1/2 to 1.1/2"
Size: M8-M36, 1/2 to 1.1/2"